The Black Liberation movement in the United States has a long history of solidarity with other grassroots struggles for justice around the world, especially in colonized countries. We suggest that when Black leaders from over 60 organizations across the country take a public stance opposing a U.S. funded and supported project of apartheid, racism and genocide, that this country needs to listen carefully rather than bellow denouncements. The platform includes a call for the U.S. government to divest U.S. aid to the state of Israel and instead, invest this money towards building infrastructure to support Black and Brown communities in the U.S. As a result, many organized Jewish groups have announced that they will cut all ties with the Movement for Black Lives, and even have gone so far as to label the BLM movement anti-semitic. We condemn in strongest terms, the backlash against the platform's inclusion of a call for ending U.S. aid to Israel and support for the global Boycott/Divestment/Sanctions (BDS) movement to hold Israel accountable for systemic human rights abuses and ongoing colonization. Israel's apartheid is also profoundly implicated in anti-Black racism. Israeli society has cultivated a xenophobic atmosphere that has had a tremendous impact on Black people in Israel. This has included police assaults and public lynchings. Ethiopian Israeli Jews led Black Lives Matter protests last year. Palestinians of African descent have found themselves targets of state violence both because of their skin color and Palestinian identity for generations. The condemnation of the Vision for Black Lives platform and disavowal of the Movement for Black Lives based on singling out one of its core planks is a brazen attack against a people's movement for freedom and liberation; this opposition stands against peace, against justice, and for the maintenance of racism at home and abroad. There is nothing anti-Semitic about a global movement for Black Lives in which African Americans connect their experiences with militarized police occupying their neighborhoods to the struggles of Palestinians living under the conditions of Israeli occupation. We see this attack as part of an ongoing, highly funded, orchestrated attempt by pro-Zionist organizations including the Jewish Community Relations Council to intimidate and delegitimize BDS activists. The agendas of these organizations are at cross purposes with the struggle against racism, war and militarism. The Israeli military and border police are subsidized to come to the U.S. and share their tactics and weapons of violent repression on children and adults with U.S. Police forces-- while U.S. Police chiefs are sent to Israel for "training" by some of the same organizations, such as the Anti-Defamation League, who are now attacking the Movement For Black Lives. The War Resisters League supports the call to BDS. We recognize the legitimacy of this tactic and its history as a powerful nonviolent resistance strategy that is most successful with broad global support, as it was in South Africa. South Africans, who themselves experienced apartheid, have been in the forefront of leading global efforts in solidarity with the Palestinian BDS movement. Like the U.S. government, Israel was militarily aligned with the white supremacist regime in South Africa. And now, those of us in the United States who want to see an end to apartheid policies and attempts to displace and extinguish the Palestinian people must match action to words by supporting the global call to BDS. We at War Resisters League have been organizing for years to end the weapons fairs and tactics exchange summits in the U.S. where local and global police and military forces convene to increase their levels of militarization and repression. 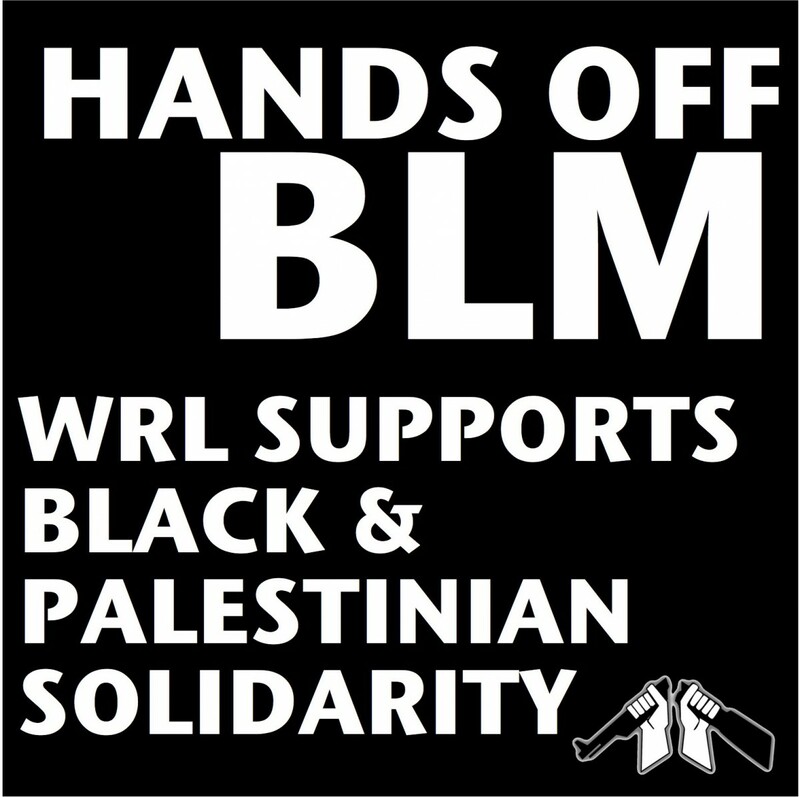 Like the Movement for Black Lives, WRL seeks to divest from policing and incarceration and invest in long-term safety strategies. Our campaign to end police militarism seeks to end these hypermilitarization summits, to end collaboration with repressive forces including Israel, and instead reinvest all those resources into programs that will actually generate community health and safety. In this work, we are deeply aligned with every area of the Movement For Black Lives' platform. From community control, economic justice and redirection of funds, to divesting from militarism at home and abroad, we will continue to do this work alongside the organizations in the Movement for Black Lives. We applaud the Movement for Black Lives for publicly naming the importance of BDS and the central importance of ending U.S. aid to Israel. We also appreciate the many Jewish activists and groups who are publicly supporting the platform, and encourage other organizations to get off the sidelines and match the courage being shown by people under fire. We endorse the M4BL platform and recommit to the urgent work of dismantling the systems that dehumanize Black and Palestinian lives, and allow for the state to kill Black and Palestinian men, women, and children with complete impunity.